Just like the Cheshire Cat, we would like you to make a card where things appear and disappear! It could be as simple as a tag in a pocket or something more interactive and fun, for example a wiper card, a slider box or a slider card or even a double slider card, a telescoping card, a T-slide card, a swing (flip-flop) card, or a ViewMaster card. These tutorials from Splitcoaststampers are for inspiration; your project does not need to be a card. Enter by August 24 , and the winner will receive three digi stamps from our sponsor! Our sponsor this month is Dilly Beans, featuring the whimsical art of Megan Suarez, famous for her charming big-eyed girls! 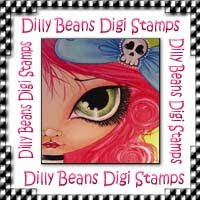 You can see the digi stamps and collage sheets on her blog, Dilly Beans Stamps. There is also a Dilly Beans design team challenge blog and an Etsy shop with Megan's artwork to inspire you. Dilly Beans offers four Alice-related digi stamps: Alice in Wonderland, the Queen of Hearts, the Cheshire Cat and some whimsical mushrooms; the design team will be featuring the first three. 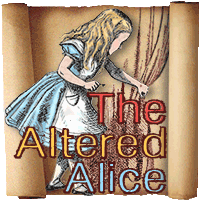 Go to the Altered Alice Blog to see this weeks Design Team inspiration. Then get to work and enter your work to win!